The GE CF6 80C2 high-bypass turbofan combines a proven design with the latest technical advances to provide the highest possible reliability in its class of engine.LPT Static Tool. The CF6 80C2 stages 1-5 are statically balanced on a taper pin tool. The static tool provides support for each of the 5 stages on a single plate. Removable taper pins are used to centre each stage. Taper pins accurate location Our balancing tooling consists of modules for the static and dynamic balancing along with their associated lifting and storage equipment. The unbladed fan hub and booster is centralised by two hydraulic pins on a through arbour. The arbour is designed to allow the tightening of holding bolts from aft side which makes it simple to install and repeatable. The arbour is supported on journals, with roller saddles that are supported on a shrouded frame assembly. Three tooling set-ups are required to balance HP Compressor. The first set-up balances the HPC 3-9 spool, the second the HPC 11-14 spool and the third the complete HPC rotor assembly. Each set-up is supplied with a shrouded frame assembly and associated slave races and hardware. An optional assembly to balance HPC 10-14 spool is now available. 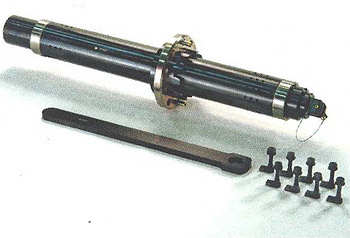 The HP Turbine set-up includes HPC rear shaft assembly and nut. The HPT rotates in negative load rollers connected to a frame, which supports a shroud. A nut and slave race is supplied. The LPT improves existing designs by simplifying the design of the forward and aft fixtures. Large windows with 90° openings on user side are provided forward and aft. The tool includes a forward drive adaptor, nut and axial restraint tooling. 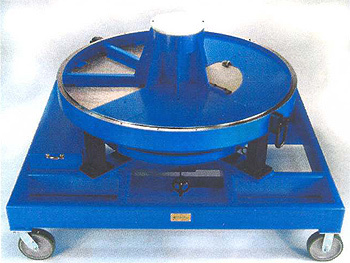 The rotor is supported on 2 custom made precision roller bearings. A drive adaptor puller and torque tool are also provided along with a storage/build stand.